This lovely crochet blanket features a dragonfly design in colorful rainbow rows and a “fluffy” white border. 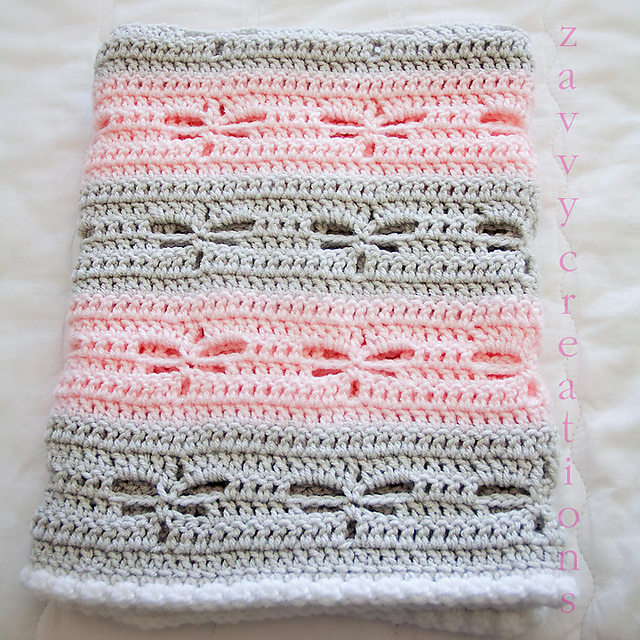 It makes a beautiful gift for a baby shower or a very pretty lapghan to keep you warm. This Dragonfly Blanket FREE Crochet Pattern is ideal for cuddling up on the couch with a good book. This pattern uses bright and lovely patterns, but you could easily switch them out for more subdued colors. It works up quickly and is an easy pattern repeat. This throw would give your armchair a touch of elegance, or it would be a great finishing touch to the end of a bed. With these colors and spectacular design, the possibilities are endless. The links for the free patterns are provided below photos. Happy crocheting. You might also like Bubbles Baby Blanket Free Crochet Pattern.